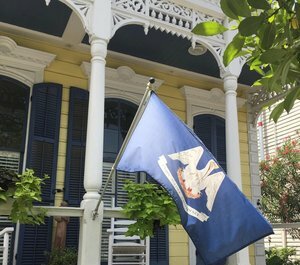 You've heard of the Garden District, with its rows of antebellum mansions, pristine gardens and southern charm. You've heard of the French Quarter, New Orleans's oldest and most popular neighborhood. But have you heard of Algiers Point, the best kept secret in New Orleans and its second oldest neighborhood? Algiers Point is located directly across the river from the French Quarter, and is the only portion of New Orleans not located on the east bank of the Mississippi River. "The Point" has the best views of downtown New Orleans and the Crescent City Connection. Getting there is easy, even if you don't have a car. Take the ferry over ($2 cash, one-way) and walk around. Click here for the ferry schedule; the first ferry leaves Canal Street at 6:15 a.m. on weekdays and 10:45 a.m. on weekends, and the last ferry leaves Algiers Point at 9:30 p.m. Monday-Thursday and Sunday and at 11:30 p.m. Friday and Saturday. Grab some breakfast at Congregation Coffee Roasters or Tout de Suite Cafe. Stroll around the neighborhood and enjoy the historic homes and oak-lined streets. Many homes are registered historic landmarks. Make sure to see Holy Name of Mary Church, a beautiful, Gothic revival structure at 400 Verret St., and Hubbell Library, built in 1907 at 725 Pelican Ave. There's plenty of art in Algiers. One stop you have to make is the Folk Art Zone and Blues Museum (207 Leboeuf St) a unique experience even by New Orleans standards. You’ll need to contact founder Charles Gillam in advance to arrange a tour; call 504.261.6231, or email gillamfolkart@yahoo.com. If you're hungry again, try Tavolino Pizza and Lounge, or Dry Dock Cafe. You can't visit Algiers without visiting Old Point Bar (545 Patterson St). The overhang in front looks like it’s about to fall off, but don’t let that stop you. The other beloved local bar is Crown and Anchor English Pub (200 Pelican Ave). “Dr. Who’’ fans will enjoy passing through the blue British phone booth to enter the bar. New Orleans has so much more to offer than its tourist attractions. For a breakdown of more New Orleans stops that are off the beaten path, listen to this podcast!